Well part time for me and full for my husband. It was a week of mostly day trips and our first overnight in a long time. We went to Wilderstein, last owned by Margaret “Daisy” Suckley, which we happened upon one day early in the spring. Pictures are in his camera and I’ll get a hold of them soon. Daisy lived there until she passed away in 1991. The Wilderstein tour is of the first floor of the home. The not-for-profit group that owns the home is slowly restoring and cataloging the family history which includes letters written by Margaret Stuckley and FDR. These letters were found under her bed sometime after her death which were turned into a book “Closest Companion: The Unknown Story of the Intimate Friendship of FDR and Margaret Stuckley” and are now the basis for the movie “Hyde Park on Hudson” . This will be a movie to see. My sweetie loves plants and things green. After Wilderstein we picked up picnic stuff at a nearby grocery store and found 4 or 5 of this beauty to bring home. I forget the name of the plant but it was inexpensive and in need of attention, he loves this kind of plant! He planted them the next day and after being at the fair on Friday has plans to bring them in later in the summer. We saw them in a plant box, so we’ll see what he can do with them. I have no doubt that they will flourish and grow beautifully. 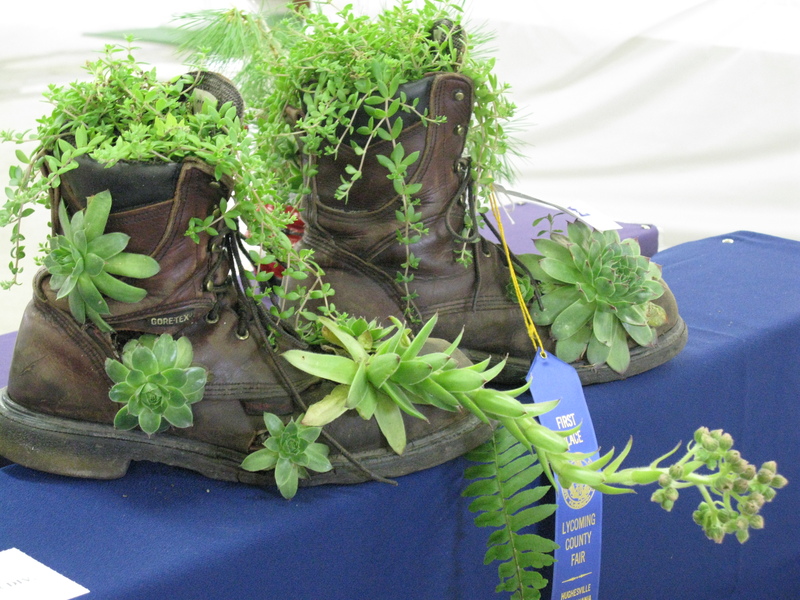 At the Lycoming County Fair we saw these repurposed boots. Clever! We have hens and chicks in strawberry pots in the front of the house. They are doing amazingly well this year, with 6 or 7 roosters this year. This makes me rethink just tossing my old shoes and maybe repurposing them for something along this line. Then again this is gardening, getting my hands dirty. Hmm, I’ll keep thinking for now and see if the idea still resonates next spring sometime. The highlight of the fair hands down was the double figure 8. The cars run 8 laps and in this race were qualifying for a race on Sunday night. One car/driver from each heat qualified from each heat. These races are rather interesting and I found a little challenging to follow as I got caught up in trying to follow the lead car(s) and who was with them. 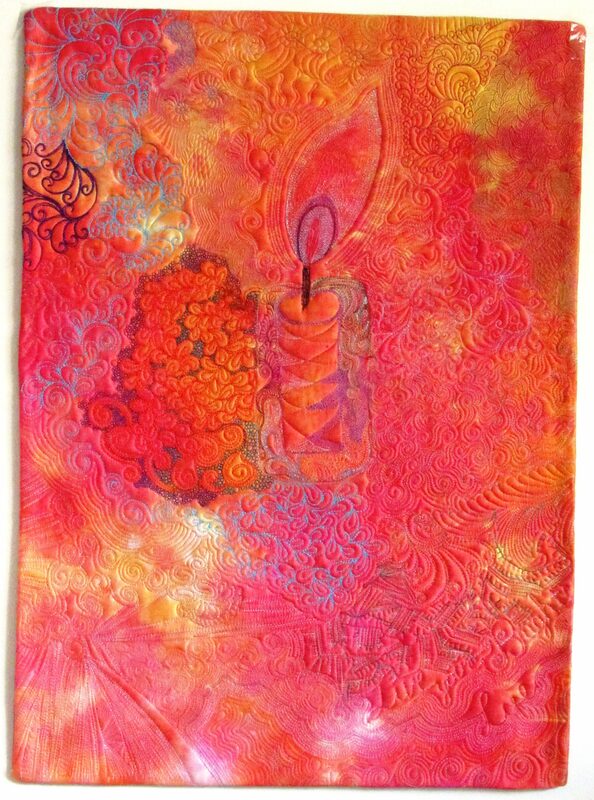 I did see a new use for a pool noodle other than wrapping quilts around. 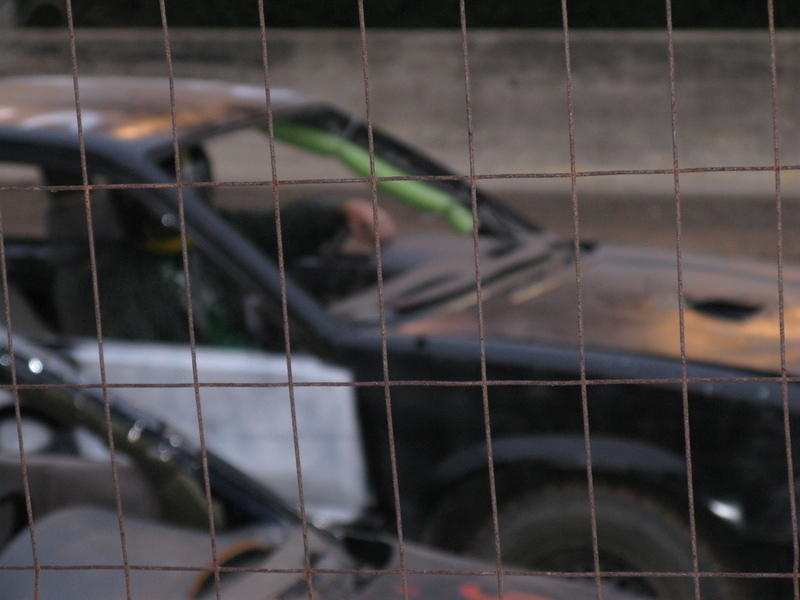 Here the noodle is potential protection for the drivers noggin. And it’s lime green, that’s cool. Two of the drivers recorded their races, I’ll check youtube in a few days to see if they’ve posted them. The last event was a demolition derby between 2 mini vans. Oh my! The guy emceeing the event did his best to get another van or two. There was a clear winner as one of the guys vans either overheated or started on fire. Not sure which. As we waited for the double figure 8 to start I was fascinated with the Ferris Wheel. I’m thinking about a whole cloth with the Ferris Wheel as the center. While we were waiting for our “main” event we watched a hypnotist for about 45 minutes. During the first exercise I watched people responding to the suggestions of the hypnotist. My husband giggled toward the end. I found the whole thing interesting with 3 people on stage and 1 in the audience being hypnotized. Someone tried to hypnotize me years ago and I just wouldn’t let them. From what the guy said there has to be an inherent level of trust and a willingness to be hypnotized. It’s a willingness that I’m glad that I do not possess. I’m going to head into the sewing room later today! 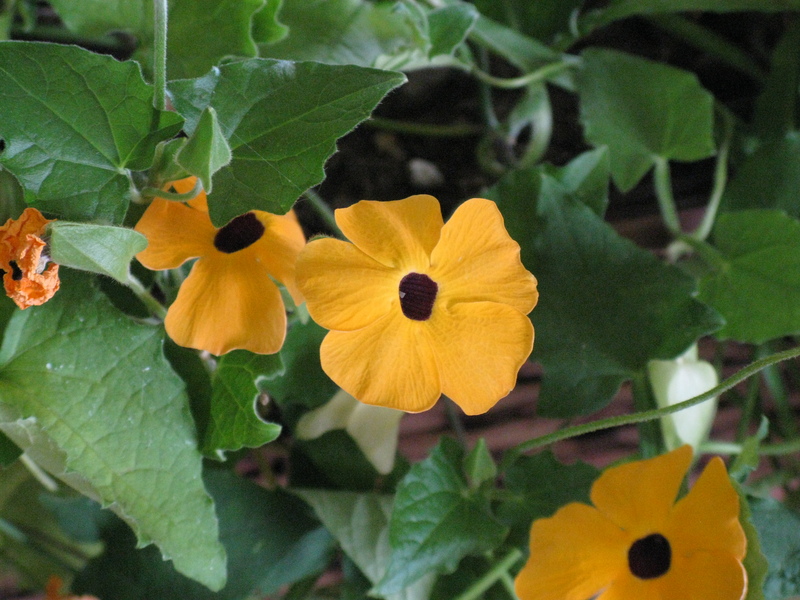 Your plant looks like a black eyed susan vine. I’ve only seen it at one local nursery. It did well for me one year, but I didn’t try and bring it in. Then again, it’s a miracle if any plant grows under my care.